How To Clean Your Customer List & Save Money on Your Next Mailing. How to do a Mailing and Get Every Piece Opened! How To Clean Your Customer List and Save Money on your Next Mailing - Part II. Last month we discussed NCOA and how it can pay for itself from one mailing (see archive section below to review the article). This month we will discuss how to get rid of those “bad addresses” on your mailing list. DSF (Deliver Sequence File) is a database that the United States Post Office has compiled and maintains. The file contains approximately 140 million records - each and every address in the United States. The file consists of residential addresses, apartments, businesses and PO boxes. Talon can help you compare your mailing list to the DSF file. If an address on your list does not exist on the DSF file then the record gets flagged and you have an undeliverable address. To improve the DSF success rate Talon will CASS certify your file and perform address correction and standardization before doing a DSF. This pre-DSF process will fix addresses that have bad information such as a bad zipcode, street or city misspelling. By performing pre-DSF clean up, Talon will fix records and make some undeliverable addresses deliverable! Once completed the DSF will be performed and your cost savings can begin! How to do a Mailing and get Every Piece Opened. Everyone reading this newsletter receives mass mailings and has first hand knowledge that many pieces do not get opened simply because we may not have interest in the product or service, or we are short on time and therefore throw away mailing pieces no matter what great offers may be inside the envelope. Recently a piece of mail came to the office that revealed a very clever design to guarantee a high response rate. Although I have no knowledge of the response rates to the mailing my gut feeling is that virtually every piece in the mailing was opened and looked at closely. Every piece being opened and examined will significantly increase the chance of a sale. Let's look at what makes this mailing impossible to throw away. The first item that helps the package get opened is that it is impossible to tell that the envelope is from a mass mailing (make no mistake though, this is a mass mailing). The mailer, Briefings Publishing Group is selling an executive newsletter and has gone to great lengths to make sure this mailing does not look mass produced. Briefings Publishing Group disregarded postal discounts such as presorts and pre-printed postal barcodes that would have saved them money. Was the mailer shortsighted and should have known better? By spending more money and forsaking postal discounts you can see in the picture below that this piece looks like someone typed my name and address and put on a stamp. I believe the piece was laser printed using a font that looks just like a typewriter and the stamp was affixed by machine too. To further increase the likelihood that the envelope gets opened, there is no return address and no copy mentioning a newsletter. The barcode on the bottom right hand corner was done at the post office and is typical of most mail going through the postal system. Pictured Left: This envelope has to be opened. First class stamp, name & address appear hand typed, and no return address. Pictured Right: A convential mass mailing envelope. See the difference? Once the piece is opened there is a folded news article and a yellow sticky note. The recipient's first reaction is that someone they know took the time and trouble to read an article, thought it would be of great interest to them, and sent it along with a note as to why it would be of interest. The sticky note has been ingeniously designed; personalized with my first name, the copy is hard to read which means I have to concentrate and decipher what someone is trying to tell me. The sticky note is signed with one initial. Horoscopes are intentionally written vaguely so that the reader can think the mass produced message was especially written just for them. The sticky note is similar in that the recipient may think they know who “J” is. Perhaps the recipient like I did, will pause to think of all the “J”'s they know. By the way the note was mass produced, not hand written. Pictured: Notice the post-it-note is personalized. It's not an accident or poor planning that the message is hard to read and signed with an initial. Once you peel off the sticky note you can read the copy that appears to be ripped from a magazine called “Executive Focus”. The two sided copy is laid out as an advertisement/article and contains an order form. 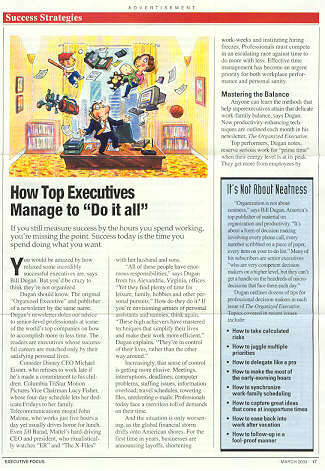 The heading of the article caught my eye “How Top Executives Manage to Do it all”. It looks as if the article came from a magazine named “Executive Focus” but my research indicates this magazine does not appear to be a real publication. The paper thickness has the correct feel for a magazine page and a ripped edge where the sheet would have been separated from the magazine. I had to keep reminding myself that this was mass produced and not done by hand. Pictured: Front and back of the magazine article / advertisment. This mailing is not for everyone. Your customers and well-targeted prospects should not have to be “fooled” into opening your packages. A laser printed envelope with a typewriter style character set, first-name matching personalized post-it-note and full price postage stamp could cost almost $1.00 per piece (that includes the cost of postage). This expensive campaign for The Briefings Publishing Group is their “control piece”. A control piece means that the mailing has been carefully tested against other types of mailings and has produced the highest response rate. 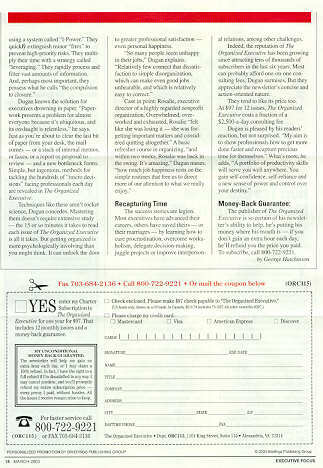 The Briefings Publishing Group wants you to spend $97 to receive 12 monthly issues of their newsletter. Their only production cost if you buy their product is additional printing of more newsletters and the postage to send them out. That's why they can spend so much on a mailing campaign if it increases their response rate. If you wanted to try a similar promotion we have the technology to produce the same type of mailing here at Talon Mailing & Marketing. Please call if you have questions or would like additional information. This month is a departure from our supply of interesting and informative links. Here is a collection of funny, strange and bizarre links that are of no use other than their entertainment value. Next month we will get back for more useful links. 50 Most Eligible People on Wall Street - Is this link less valuable in a bear market? Know of a good link we can use? Please email us at mb@talonmm.com.